Plenty of animals fly; this is no surprise to anyone who actually comes from Earth. However, there are plenty of “flying” animals that are really gliding versions of other animals. You don’t expect your average rodent to come drifting from the skies, let alone some of the other creatures in this list. No, we typically think of flies (it’s right there in the name), birds and maybe bats when we think of flying animals. Even then, quite a few of them creep us out. Get ready to feel unsettled every time you are in an open field from now on. Okay, if you have no idea what a phalanger is, join the club. They are apparently an Australian subfamily of possum that manages to survive the horrors of that island continent by cuting them into submission. I mean it, that picture is an adult. I can only imagine the babies are…. Holy crap… Lookatthose… If they made Care Bears that looked like that, adult men would scream and cry if they were forced to leave Toy ‘R’ Us without one. These things are called flying lemurs because “air sailing horror-beast” was too wordy. Or maybe because they are related to lemurs. Believe it or not, that is the closest thing on earth to being a primate without actually being one. They are also called colugos and outside of bats, they are the mammals most highly adapted for flight. 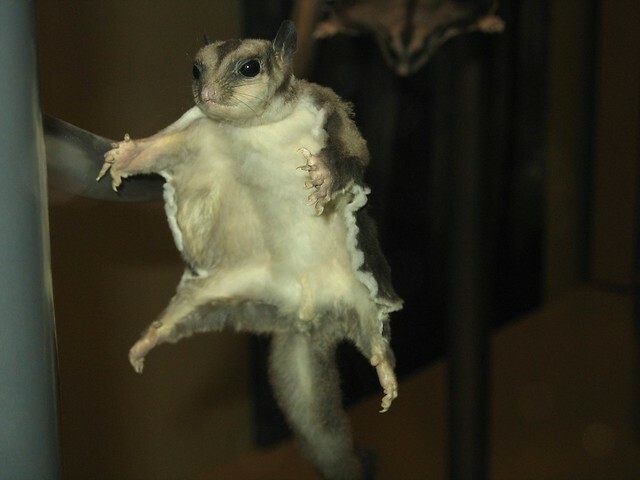 As you can see, their limbs and tail are connected by flaps of skin that connect out to the very ends of them, thereby increasing their surface area and making them better gliders. They are apparently incredibly bad climbers, which is odd since they glide rather than fly, but are extremely maneuverable and can glide up to 3230 feet, with almost no loss in height. (most other “gliders” are more accurately “controlled fallers”). They are also really scary looking animals that have no doubt inspired tales of flying monkeys stealing children. I am of the mind that lizards, at least the small ones, are kind of cute. They often have big doe-like eyes and rid the world of bugs. However I am also of the mind that anything that drops on you from a tree unexpectedly is instantly frightening. Pictured above is an Indonesian lizard of the genus Draco, which as you may have guessed, means “dragon.” They have been known to glide as far as 195 feet while only losing 30 feet in height from the initial jump. Unlike the flying mammals, they don’t have loose skin strung between their arms and legs for gliding, but rather extended ribs, which makes them about the only thing in nature to achieve a super power by being blended with one of Jigsaw’smurder machines. If you are afraid of snakes, you probably did not need to know that in some parts of the world, you are in danger of them gliding out of the forest canopy and landing on you. Sorry about that. They also live in the same parts of the world as the flying lemur and the flying lizard, which makes me wonder, what is in those trees that is so bad that multiple animals evolved gliding abilities to escape it? The flying snakes are “mildly venomous”, which means they have poison, but it is not harmful to humans. Likely 90% of the people who read that don’t care about the “not dangerous to humans” part and will likely focus on the fact that South East Asia and Indonesia have flying poison snakes. Life in that part of the world must be like a game of Pitfall. Finally, we move past horror animals into merely curious. Flying frogs have apparently evolved from several different lines of frog, in most places in the world where there are tree-dwelling tropical frogs. They developed their “parachuting” ability as a means of predator evasion, and fortunately lack the pants-wetting ability of flying lizards and snakes because even a giant house-sized frog would be inherently adorable. Appropriately enough, the first described flying frogs were found in Malaysia and Indonesia, where they spend their lives dodging every other flying creature. I can only imagine the forest skies of those nations look like air traffic control screens, only filled with bug eating animals and snakes. Okay, no more jumping out of trees, these guys live in the ocean. While flying from one tree to another is impressive,leaping out of the ocean and gliding 160 feet is awesome. Now, the flying squirrel may have the tree to tree world record, but they have nothing at all on flying fish. The record for a sustained glide by a flying fish is 1300 feet, at a speed of 42 miles per hour! The achieve flight by beating their tail 70 times a second and launching themselves out of the water, then ride the updrafts waves produce. They can fly up to 20 feet vertically into the air, and sometimes accidentally strand themselves on ships. Those are impressive numbers for an animal that is generally designed to swim for a living, and can’t even breathe air. What is 17 feet across, weighs over a ton, and can launch itself out of the sea? Why, a mobulaof course! As rays go, they are only second in size to the manta ray, and they can jump as high as 6 and a half feet out of the water. Now, there is some danger here; a woman in Florida was killed when an eagle ray jumped into the boat she was on and hit her, and they top out at a few hundred pounds. Imagine being hit with a flying ton of fish. Still, there are videos on youtube of these things breaching, and it is pretty damn spectacular. Okay, so there are species of ant that fly with wings, so what is so interesting about “gliding” ants? 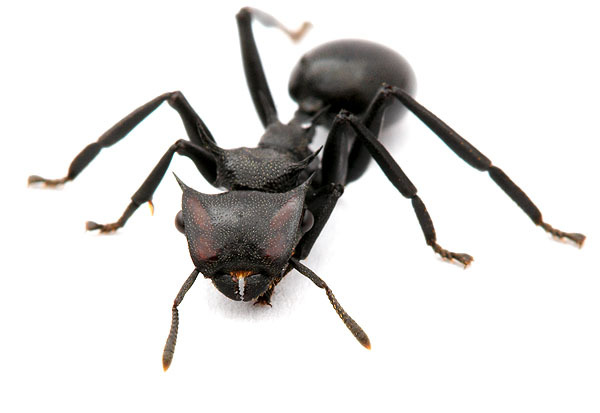 These are un-winged ants that fall into a very specific subset of requirements, like having good eyesight, living in rain forests that flood, and forage for food at the ends of branches. They also tend to be armored. When they fall from trees, they focus on the lighter color of the trunk against the darker forest background, and then flatten their head, legs and abdomen and then glide from free-fall to a J-shaped flight, and then grasp the tree. The whole thing seems to have developed as a way to avoid falling out of trees and being eaten on the forest floor. Gliding ants have an 85% greater chance of falling and landing on a tree than ants that just fall. So nature deigned ants that are clumsy, but make up for it by being X-Men. 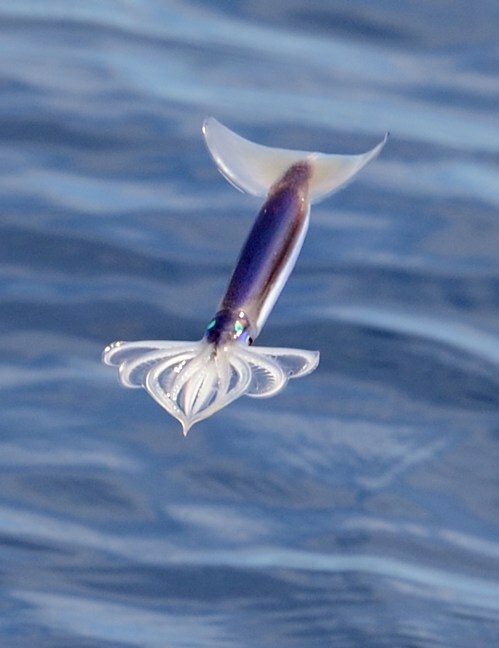 That is no PhotoShop, that is an actual squid gliding over the ocean. Believe it or not, they actually display behaviors that show they actively maintain their glide, meaning they may not be gliders at all and may actually be flying squids. They act very much like the flying fish, using their ability to evade predators, and also wind up on ship decks. Scientists aren’t exactly sure how they manage to launch themselves or maintain their flights, which adds a layer of mystery to the already weird fact that they are cephalopods that can take to the air and glide. Flying fish can be related to at least a little bit, since we probably evolved from fish some time way back in the past, but the only mollusks to ever leave the water were snails and slugs, so this is kind of like the fish skipping the amphibian and reptile stages and jumping right into birds. There’s also the flying or gliding spider, and spiders that use silk to ‘balloon’ through the sky. There is a diference between “Flying” and “Gliding”. What glides, eventually falls. Honestly, I wouldn’t put the rays into the same category as the others. They basically get less air time than dolphins. As for the gliding ant, I noticed that the author stated there are species of flying ants.